Now it just needs to breathe fire! No, its not a baby dragon! 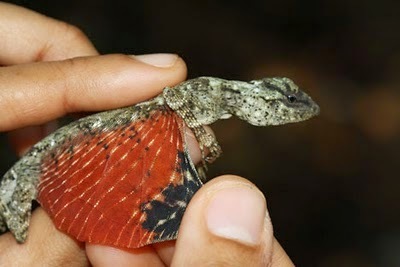 Meet Draco volans, an arboreal lizard found in Indonesia. Unlike mythical dragons, it lacks the ability to sustain powered flight, and is capable only of gliding. Still, it looks very cool! The flying dragon occurs in southern India and Southeast Asia. This includes the Philippine Islands and Borneo. The species prefers rain forests and tropical areas that can provide adequate number of trees that the lizard can use for jumping and gliding. Flying lizards also have a gular flap called a dewlap, under the head. This tissue is used in courtship displays. The body is depressed and elongated. Males have an average length of about 19,5 cm while females are slightly larger, with an average length of about 21,2 cm. This includes the tail which on average is 11 cm long on males and 13,2 cm long for females. Male flying dragons have a long pointed dewlap, which is bright yellow. They also have bluish color on the ventral side of the wings, and brown on the dorsal side. Females have a smaller and bluish gray dewlap. Furthermore, the ventral side of the wings is yellow. D. volans is not the only flying lizard, it's just the most popular. The Draco genus contains more than 40 species, all with wings and the ability to glide. D. Volans is distinguished from other flying lizards by the rows of rectangular brown spots on the top of the wing membranes, and black spots on the bottom of the wings. To move fast from one place to another (e.g. when escaping a predator), flying dragons will spread the skin flaps along their abdomens and glide out of trees or from other high areas. They never glide when it is raining or when it is windy. When the Flying Dragon is about to take off, it will point its head toward the ground. They can glide for 8 meters on average which is pretty amazing considering their small size. 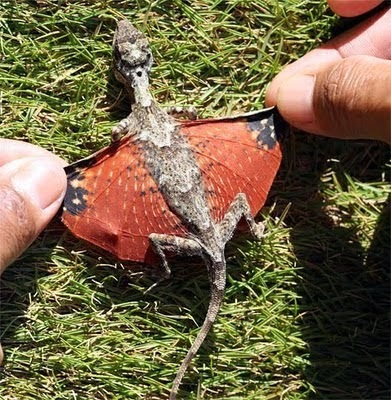 The flying dragon is an insectivore, usually feeding on small ants and termites. It appears to be a "sit and wait feeder", meaning that it sits next to a tree trunk waiting for prey to come by. When ants or termites are close enough, the lizard picks them up with its sticky tongue, without shifting the body and then chews them. Flying dragons tend to be very territorial. 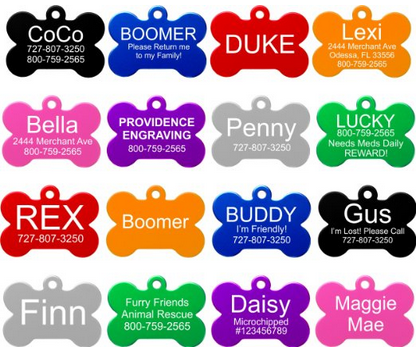 Usually, males mark two or three trees as their own, with one to three female lizards living in each tree. When a male meets another animal, it may extend the dewlap partially or fully, extend his wings partially or fully, perform a combination of dewlap or wing extension, or bob his body up and down. 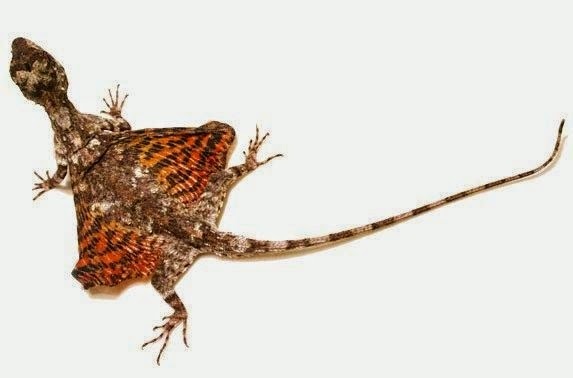 Extending the wings and dewlap makes the flying lizard appear larger, and both sexes may exhibit such behavior if threatened. If a male meets a female, he may circle her. The exact mating season is not known, but assumed to be somewhere between December and January. The soon-to-be mother builds a nest for the eggs by creating a small hole on the soil using her head. Then she will lay five eggs into the nest and cover them with dirt, packing the soil on top of them with a patting motion of her head. She will stay with them for approximately 24 hours, and during this period she will guard the eggs fiercely. However, after about one day she will leave the nest. Incubation take approximately 32 days. Although not official assessed, the species appears to be quite common and is not believed to be threatened. - Card, Winston C. 1994. Draco Volans Reproduction. Herpetological Review 25(2) p.65. - Mori, Akira and Tsutomu Hikida. 1994. 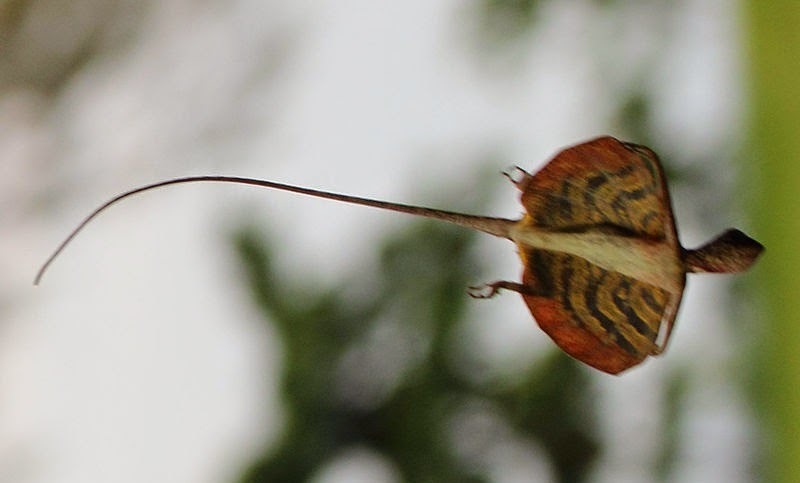 Field Observations on the Social Behavior of the Flying - Lizard, Draco volans sumatranus, in Borneo. Copeia No. 1, pp. 124-130. Taylor, Edward H. 1966. The Lizards of The Philippine Islands. A. Asher and Company. Amsterdam.